Ok, so you know how I said here, that I was going to post 5 of my favorite easy weekenight recipes for all you busy people who still want to have a home-cooked dinner once in a while? Then remember how I said here, that I have a big problem with follow through? Yeah, so here is the 3rd long overdue recipe in that series. I was never a big fan of traditional stuffed peppers, but I think these flavors work better together and you can use any color bell peppers. 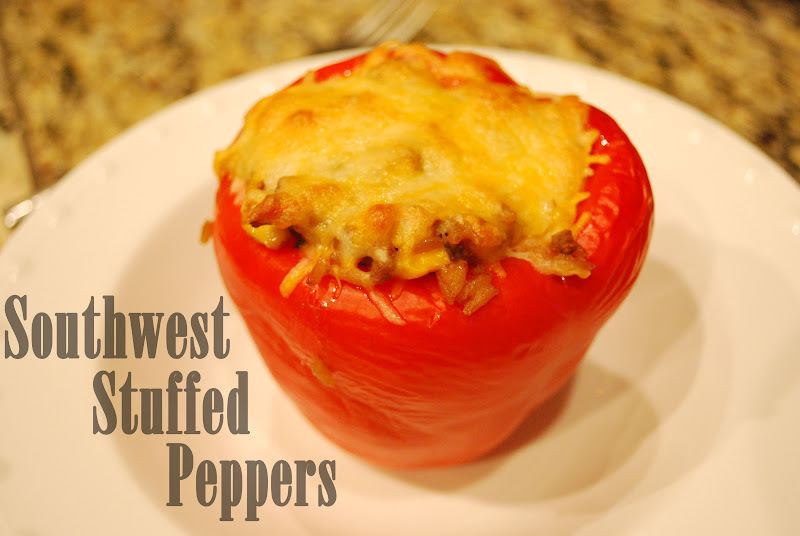 I was never a big fan of traditional stuffed peppers, but I think these flavors work better together and you can use any color bell peppers. It was inspired by this skinny version, which has great ideas for low fat substitutions. I changed it up a bit, and this is now one of our favorites around here. Cut the tops off the peppers and scoop out all the seeds. Boil the hollowed peppers in water for 7-8 minutes. Put them upside down on paper towel to cool and drain when done boiling. While peppers are boiling, work on the filling. First brown and drain 1 lb. of ground beef. Turn off the heat and add to the beef 1 can of the mexican corn mix, the spanish rice, and about a cup of sour cream. Stir until well combined. Place peppers in a baking dish (I just use a 9 x 9 ceramic pan because then they help hold each other up). Line each pepper "cup" with a slice of pepper jack cheese. Bake in the oven for about 30 minutes or until cheese on top is bubbly and slightly browned. Serve with an extra dollop of sour cream and possibly some hot sauce for added heat.